America’s entry into the Second World War required the mass mobilization of infantry on a scale not witnessed since the Civil War. To prepare properly for the variety of combat theaters, specialized troops were needed to handle the deserts of Africa, the forests of Central Europe, and the mountains of Italy. 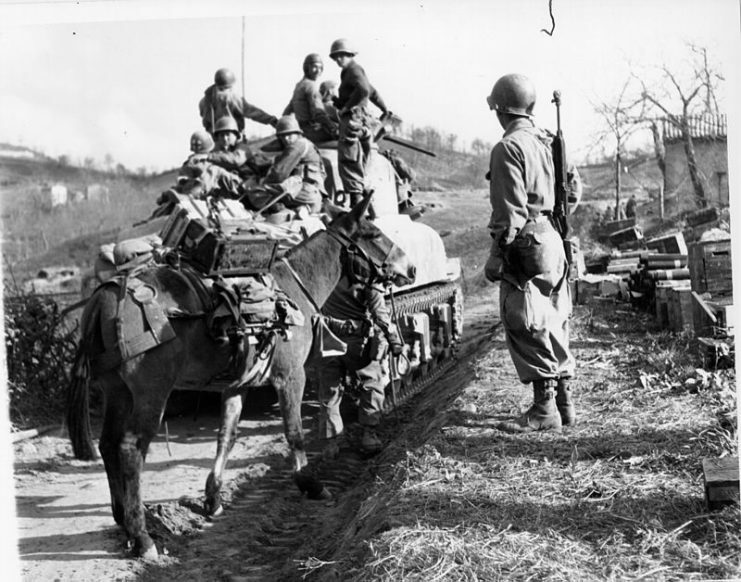 To handle the mountainous terrain of northern Italy, the United States mobilized the 10th Mountain Division. A light infantry division based out of New York, the division was first organized in 1943 before being reorganized the next year. Deployed to Northern Italy in the dead of winter, they participated in battles across the former Fascist nation. 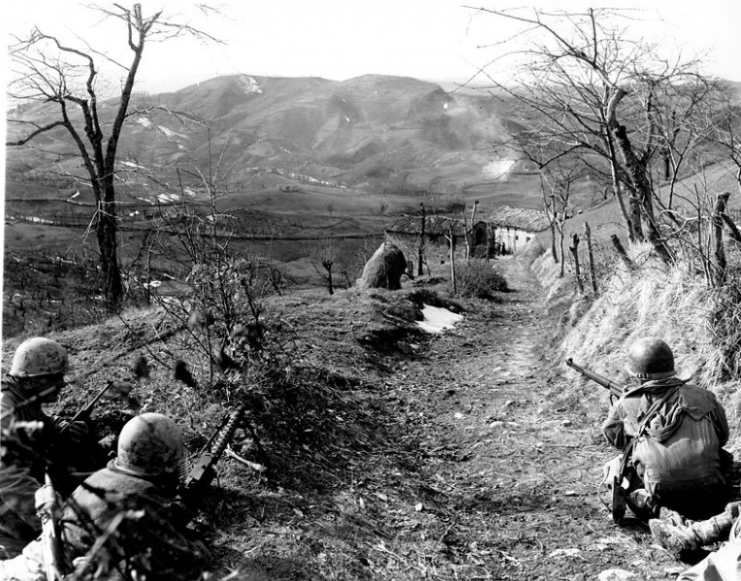 From Pisa to Udine, the 10th fought as ski troops through some of the most difficult terrains in the European theater. Enduring 114 days of combat, the unit suffered 992 killed in action and 4,154 wounded. For their efforts, members of the 10th received two division campaign streamers, 7,729 Bronze Stars, 15 Soldiers Medals, 7 Legions of Merit, 449 Silver Stars, a Distinguished Service Medal, three Distinguished Service Crosses, and John D. Magrath received a posthumous Medal of Honor. A machine gunner and two riflemen of Co K, 87th Mountain Infantry, 10th Mountain Division, cover an assault squad routing Germans out of a building in the background. Sassomolare Area, Italy. Porretta Moderna Highway. 4 March 1945. With operations in Italy complete by the end of May 1945, the unit was prepared for the invasion of Japan. Though their expertise on skis would have proved valuable in Japan’s mountains, World War II ended before they could be deployed. Thus the 10th went home. 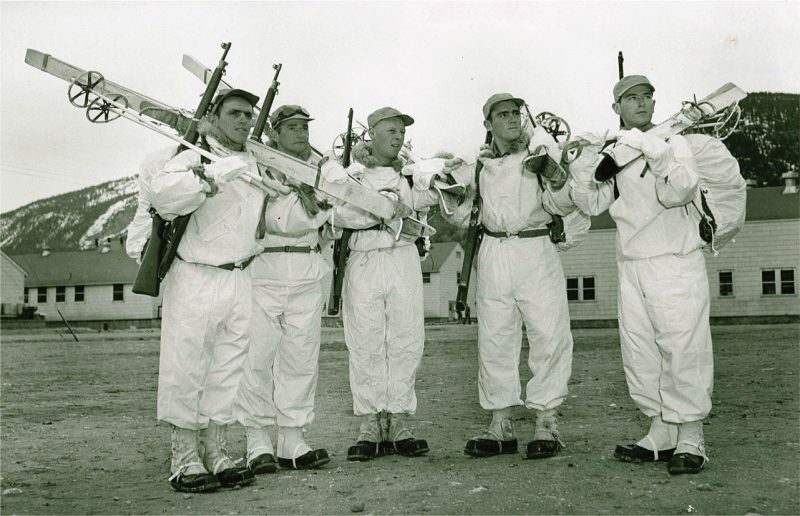 With the war over, the men of the 10th continued skiing, applying the expertise they learned during the war to civilian life. Many of them pioneered the modern ski industry, starting magazines, ski lessons, and ski resorts. Bill Klein, a soldier in the unit, founded the Sugar Bowl Ski Resort. All told, over sixty ski resorts were established or managed by veterans of the 10th, including Aspen, Sugarbush, Vail, and Whiteface Mountain. 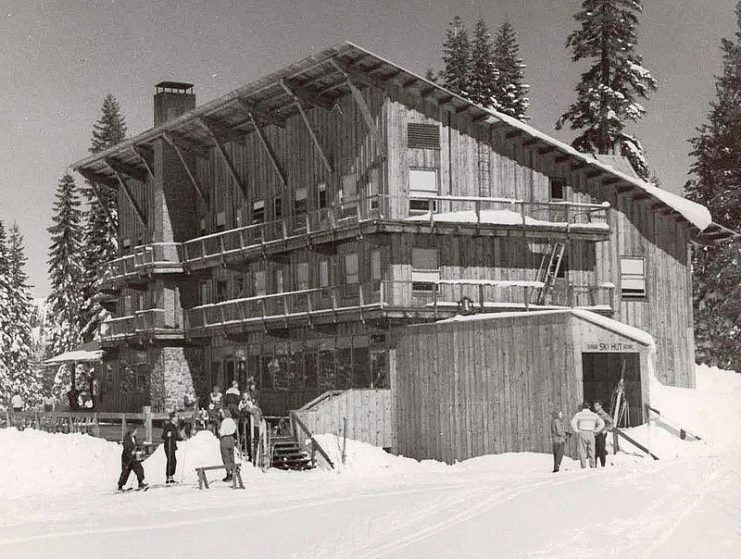 Keston Ramsey (the founder of Sky Tavern Resort), Bill Berry (Sierra ski historian), and Chelton Leonard (future University of Nevada ski team coach), all fought with the 10th. They put their knowledge to use fighting for their country. Through mountains and snow, the light infantry utilized their skills to the utmost, fighting and dying amongst mountains of Italy. 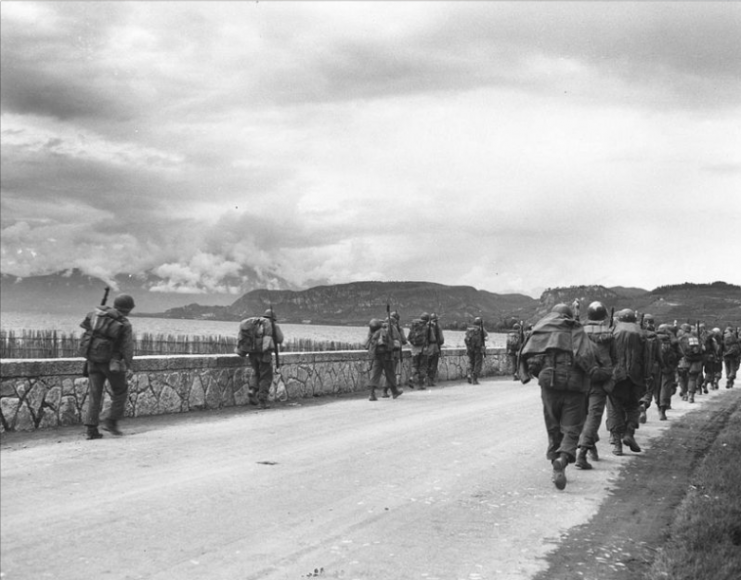 Members of the 86th Infantry Regiment, 10th Mountain Division, march north, near Malcesine, on Lake Garda, without meeting any resistance. Rearguard action is all that has been encountered so far. April 29, 1945. Leonard was one of many freshmen from the Nevada ski team at the time who joined the army to put their skills to use. Joe “Barnes” Berry was another one. The two would serve together throughout the war. While training for the war in 1942, they ended up performing as stunt doubles for an Abbott and Castillo movie, Hit the Ice. 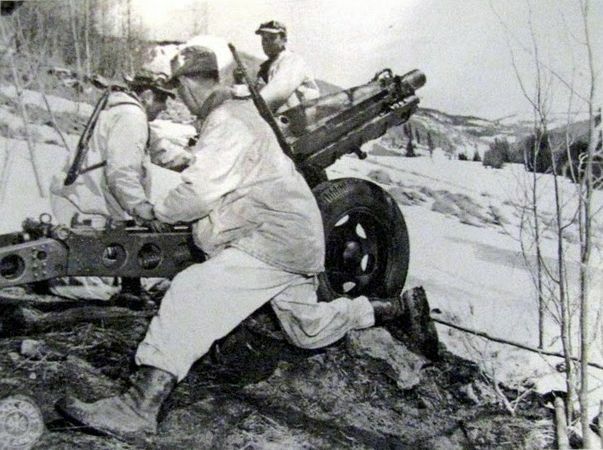 Soldiers of the 10th Mountain Division fire a 75 mm pack howitzer, Mt. Belvedere, February 1944. Leonard would go on to work for the International Federation of Mountain Soldiers, an organization dedicated to transcending violence through a mutual love of mountains, snow, and skiing. Berry would coach the Nevada ski team for a decade and serve as a technical advisor during the 1960 Olympics. Read another story from us: Three Italian PoWs Broke Out of a PoW Camp, Not to Escape But to Climb Mount Kenya For Fun! He was right. Having fought for their country and the liberation of a foreign foe turned ally, the World War veterans of the 10th would go on to instill their love of skiing to the country. Thanks to them, Americans can compete in the Winter Olympics with confidence, and many Americans can find places to spend the day skiing, knowing there will be a warm and well-stocked cabin resort waiting for them.